Good morning, all! In the United States we are waking up from our annual turkey feast, a day and meal surrounded by traditions of all sorts. One of my favorite Thanksgiving morning traditions is listening to a National Public Radio program called “Turkey Confidential,” in which Lynne Rossetto Kasper and a selection of celebrity cooks take calls from people with problems like, “I put too much cayenne in the cranberry sauce!” and get advice like, “Add a little fat, like cream, to cut that heat.” It’s folksy and amusing, and celebrity chefs join in as well. And I do it every year, so: it’s a tradition. Waiting for us, just around the corner, is Advent, which almost all of us observe in some way…whether by that name or no, we are all preparing for the coming of the Christ. Today’s Friday Five, following that line, is Advent Confidential. What are your favorite traditions, observances, hymns, or memories of Advent? Is there something you remember from childhood that you’d like to do again? A funny story you can share about the time the Advent wreath got a little over-lit? We are here and listening! Interspersed with the music were readings from the Bible. Occasionally, I still listen to the BBC broadcast of Lessons and Carols as I go about my tasks on Christmas Eve. Stockings are the fun way that we give each other little things — many times they are not big enough to warrant a real package. But they range from the sublime (soft fuzzy socks) to the ridiculous (googly eyes on pencils.) And of course, there’s chocolate and gift cards. 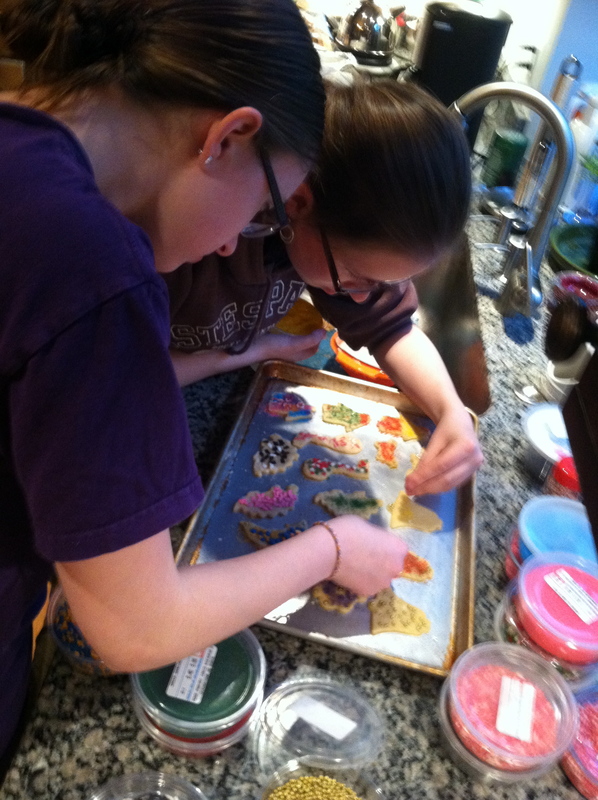 We all participate in doing this, and some of my favorite gifts over the years are hand-crafted gifts from our daughters. We didn’t usually go to church on Christmas Day. Christmas Eve, always. On those rare years when Christmas fell on a Sunday, we did put on our pretties and out to church. Christmas Eve services over the years included pageants where I was one of the actors, singing in the choir, or ringing handbells. Only when I had a baby in my arms was Christmas Eve something that I observed! Depending on where I am serving (hospital, church or other setting), I still participate in Christmas Eve festivities. We started this tradition with our children, and it is one that we still enjoy. (In fact, this weekend, as we decorate for Christmas, one of the items that I must find is the Advent wreath!) 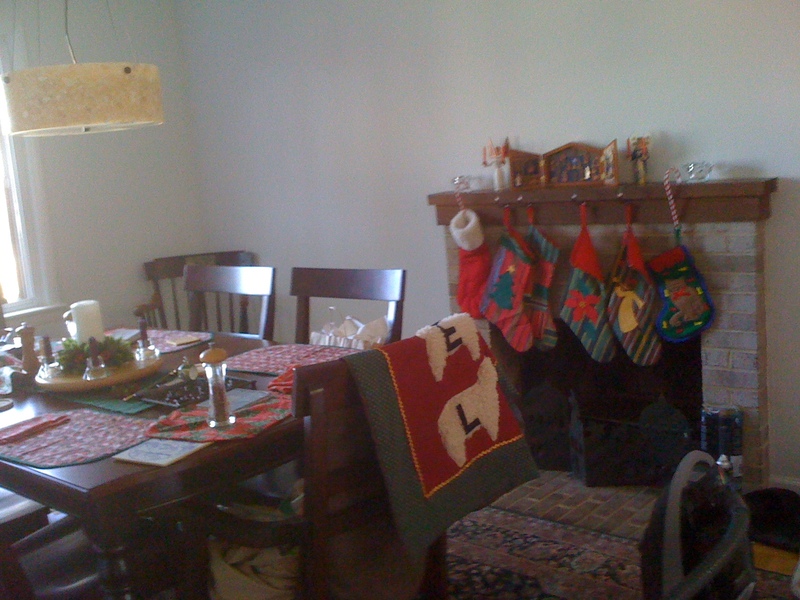 We place the wreath in the center of our dining room table. We will light the first candle a little early as our college student and out-of-the-nest daughter will be heading out on Sunday morning. Our song of choice is O Come, O Come Emmanuel. Lighting and snuffing the candles is a part of our children’s memories of Christmas. I know. Well, DUH. We bake Christmas cookies (sugar cookies that we decorate), and many, MANY kinds of cookies including the chocolate “kiss” ones, schaum tortes (meringues), fudge, and tea cakes. There’s cookie exchanges, cookie gifts, and so on. I have a supply of cookie cutters and decors that gets busted out this time of year. It’s a lot of fun. BONUS: The Christmas I’d like to forget. But never will! A few days before Christmas, the first year in our present home, our older daughter got the flu and missed the last few days of school before winter break. My parents were arriving to have Christmas with us, and we were worried we would “share” this virus. Well, share we did. My husband got sick, then our toddler, and finally me. I was supposed to help lead worship on Christmas Eve when instead I was… very, very ill. A call to our pastor in between trips to the bathroom (“No, I’m really sorry, I can’t be more than five feet away— GOODBYE!”) got me out of my responsibilities. “When she stops dripping…” Words of wisdom I have never forgotten! LOL! I love your mother’s wisdom (wait for the dripping to stop…) And oh, Lessons and Carols! 🙂 thanks for playing!